Successfully Added Car Checker Code Reader for OBDII to your Shopping Cart. Handheld OBD2 electronic car diagnostics tester for when your car's check engine light is on. This handheld scanner gadget will allow you to diagnose and solve a huge range of engine code issues. The OBD2 code scanner plugs directly into your car with no need for batteries and will read diagnostic data in plain language on the built-in display. 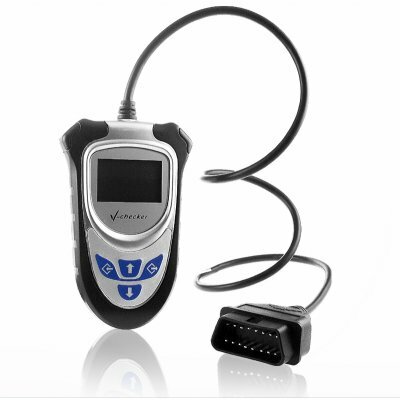 With this smart reader, immediately self-troubleshoot the cause of the Check Engine light, erase trouble codes, and shut off (reset) the check-engine light. The OBD2 scanner can also read the data stream of the engine, including engine speed, calculated load value, engine coolant temperature, and throttle open state! The perfect car accessory for any DIY car mechanic that is now available at a low wholesale, factory direct price. Get yours today while they are still legal for import! Will This Code Reader Work with My Car? This OBD II Code Reader is specially designed to work with all OBD II compliant vehicles. It is required by EPA that All 1996 and newer vehicles (cars and light trucks) sold in the United States must be OBD II compliant and this includes all Domestic, Asian and European vehicles. A small number of 1994 and 1995 model year gasoline vehicles are OBD II compliant. To verify if a 1994 or 1995 vehicle is OBD II compliant, check the Vehicle Emissions Control Information (VECI) Label which is located under the hood or by the radiator of most vehicles. If the vehicle is OBD II compliant, the label will designate OBD II Certified. Additionally, Government regulations mandate that all OBD II compliant vehicles must have a common sixteen-pin Data Link Connector (DLC). For your vehicle to be OBD II compliant, it must have a 16 pin DLC (Data Link Connector) under the dash and the Vehicle Emission Control Information Label must state that the vehicle is OBD II compliant. This label is located on the inside of the hood on most vehicles. The CVELY-CK works on vehicles that's are OBDII compliant. The best way check if your car has an OBDII slot is to check the car user manual, contact your car dealer or talk to your favorite mechanic. IMPORTANT NOTE: As the wholesaler, we provide the package containing the CVJH-A23 OBDII device. Chinavasion provides no customer support regarding its use. We cannot give advice regarding how to read codes or tell you if your model car is compatible with this particular product. If you have questions regarding the use of the Car Checker Code Reader for OBDII we suggest you search for internet forums related to car maintenance. Does this code scanner work on my Honda Civic 2006 model? Can I test my 1986 Toyota Corolla with CVELY-CK code scanner? This model diagnostics code scanner only works on cars manufactured from 1990 onwards and are OBD2 compliant, to check to see whether earlier models are OBD2 compliant, you should refer to your car user manual or contact your local Toyota car dealer. Does the car checker code reader for OBDII product code CVELY-CK work for 2001 BMW and Mercedes Benz models? No, but the professional grade OBD-II + EOBD code reader + scanner product code CVELY-1019 supports 2001 BMW and Mercedes Benz models. This is a very handy machine. Within days of receivig it our engine management light came on and we attached the car checker code reader and it told us instantly what the problem was. We are now able to go to the garage and tell them what the problem is. The only reason I haven't given it 5 stars is because you cannot change the on screen language. I live in Spain and it would have been useful to be able to change the language and show the garage what the problem is.